Discussion with a Hermit on the Jesus Prayer, by Metropolitan Hierotheos (Vlachos) of Nafpaktos. One of the best books on meeting a modern spiritual elder, and, in retelling that meeting, the importance and meaning of silent interior or hesychast prayer. 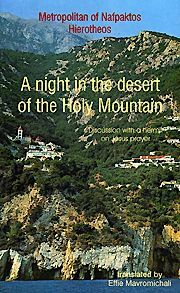 “A Night in the Desert of the Holy Mountain” is a book which brings to light the quintessence of Orthodox spiritual life: the Jesus prayer or prayer of the heart and how it can be practised by both monks/nuns and lay people. The discussion flows in a spontaneous and immediate way with the dialogue form of the book contributing to this. The reader enjoys the simple presentation of the teachings of the Church on the Jesus prayer, through the authentic experience of an Athonite hermit. And “when a hermit’s mouth opens, it fills you with fragrance”. The Holy Mountain is a blessed place for the entire Church. There are monks there who practise without ceasing the Jesus prayer and who struggle to live the ascetic life, which is actually life according to the Gospel. Thus they become bearers of the Holy Tradition of the Church. It is with such a monk and ascetic that the author of this book enters into dialogue. The book has been a classic of its kind in Greece where it is now in its ninth edition. Softbound. 194 pp.